To Quickly Receive A Concrete Overlay Quote in Sacramento, CA, Give Monsters Concrete A Call Today! Are you interested in permanently covering up a surfaces imperfection on existing concrete? Or do you want to turn a drab slab into something nice and pleasant to look at? WIth decorative overlays, it's become incredibly affordable to give almost any concrete surface a compete face-lift. At drastically lower costs than removal and replacement. There are a wide variety of different finishes when it comes to concrete overlay in Sacramento. Call Monster's Concrete of Sacramento today and we can go over what your options are. Cement-based overlays have been around for a very long time. many of today's products are a blend of polymer resins with sand, cement and other additives that improve the overall performance, aesthetic quality, and wear resistance. Polymer-modified overlays are able to be applied in layers as thin as a business card or many inches thick without ever delaminating or failing. Concrete Overlays adhere great to existing concrete and will resist damage from chemicals, freeze-thaw conditions, uv exposure and abrasions. Wile many of the polymer modified overlays offer a very similar array of benefits, each system has its own characteristics. Overlay manufacturers each use a different type or types of polymer resin. They often blend them and produce proprietary products with distinct attributes. Many of today's overlays use acrylic blends since they provide the best bond strength and UV resistance. Concrete overlays in Sacramento are used in a number of different ways. Whether it is to meant to maintain or protect the integrity of a concrete slab or pavement. It can provide a new surface as well as extend the life of your structure rather than having to replace it. We are renowned as one of the most trustworthy concrete contractors in Sacramento. We are undeniably the perfect partner for any concrete related services for the dwellers of the Sacramento area. We have constructed our unbeatable reputation in the construction industry through our dedicated and loyal service for our respected clients. Structurally, we continue to excel with the professional expertise we have. We have the best of equipments including modern machineries and workers that are highly knowledgeable about the latest methods to give you incredible service. We promise you that we are never that company that compromises on structural quality as well as aesthetic beauty on any levels during construction and finishing works. The quality of the materials we use will always be the best in standards available so that the clients never have to worry about the durability. We stay updated about all technological advancement happening in the concrete construction sector, so the works we do will always look modern. We continuously keep innovating in the standards of design and beauty in all the projects we undertake. We give utmost importance to client satisfaction, when you hire us for any of our concrete related services in Sacramento. The committed service we offer to our clients over all these years have helped us to be regarded as the name synonymous with reliability. We continue to put the best of efforts to keep up our reputation in the concrete construction industry of Sacramento with our strong presence. 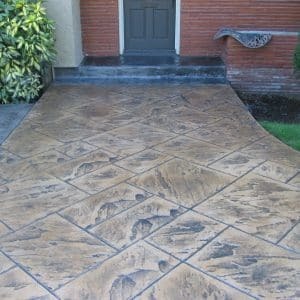 That is why when it comes to concrete overlay Sacramento, we make the ultimate choice for the residents of Sacramento. As said earlier, we are the only company that provides full fledged solutions for all your concrete needs. Our superior service includes concrete breaking, masonry removal, concrete demolition, concrete removal, concrete installation, and concrete hauling, to name a few, and among concrete overlay Sacramento, we enjoy a reputable status among the residents of Sacramento. Stamped overlays are very much like conventional stamped concrete. However, they are much less time consuming and labor intensive than concrete replacement. The overlay mis is applied by a rake, which creates a smoothness to the surface. It will then be imprinted with textures or stamps depending on the clients needs. Stamping tools come in many patterns, which can allow the concrete to mimic other building materials such as stone, brick, wood or marble. Spray Down overlay concrete in Sacramento This finish is sprayed onto concrete with an air-powered sprayer with provides a smooth finish. If you are interested in a textured surface is preferred, it can be applied in a spatter like fashion. This creates a slip-resistant texture. Self leveling concrete overlays in Sacramento These overlays level themselves without having to use trowels, this makes them very convenient for smoothing out uneven concrete. The material is poured onto the surface it is then spread evenly. Aided by its own weight and viscosity it levels out perfectly. Micro Toppings for concrete overlay in Sacramento These "micro-toppings" are purely decorative, this particular overlay is spread to create thin overlays. You can either apply them as single layers or it can be applied for different effects. If you think that your concrete is in need of a face-lift. Then call us today for an estimate on a concrete overlay in Sacramento. CONCRETE OVERLAY Sacramento Wondering about how we can help in concrete restoration Sacramento? Here is how we can help you. First of all, concrete overlay simply means giving a makeover for the concrete floor. The floor may need a makeover when it gets scratched. 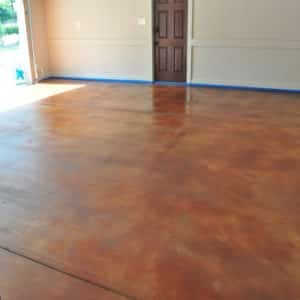 You can also give a fresh look to the room by opting for a concrete overlay from the best Sacramento concrete overlay service providers. Concrete overlay services will help to give a decorative coating to the original concrete floor. There are numerous design possibilities when you choose concrete overlay. Moreover, the overlay materials can be made by blending cements and polymer resins. Polymers will enable strong bonding in the existing concrete. The thickness of the overlay product and the materials used to blend can be different from the choice of the manufacturer. It also helps you give new textures and designs to the concrete floor. Among Sacramento concrete restoration services, Monsters Concrete Sacramento makes one of the best choices as it includes experts in concrete construction. Here’s why we are special. What makes Our Concrete Overlay special? We enjoy a superior position among service provider of Sacramento overlay concrete services. The best part of hiring us is the professional expertise of our matchless team. When it comes to the experience of the workers at Monsters Concrete Sacramento, we are indeed the sought-after name. Our team includes people with almost fifty years of involvement in the concrete construction sector, which means when you hire us, you can be guaranteed of expert service. We stand by the side of our clients from the planning stage to the final level, and the committed team will support you with their expertise in improving the concrete floor. You can be assured of the superior aesthetic appeal and quality of work, when you hire us for concrete restoration Sacramento. We are experienced and capable of doing any types of concrete overlay services, let it be modern styles of traditional designs. 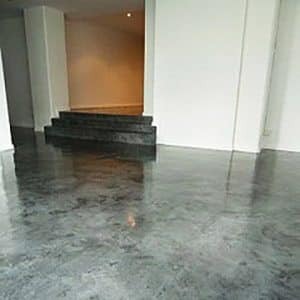 When you hire us, you are guaranteed with excellent quality service, be it anything related to the concrete floor. Quick response and timely completion of the job is yet another advantage of hiring our services. Furthermore, our services will never be over-priced and will always be affordable for our clients. The superior position we enjoy is just a superior position among Sacramento concrete overlay service providers, and it is a result of the dedication and perfection towards the work we do. Call us right now! When it comes to concrete overlay Sacramento, it has to be done by experts or else it will reflect in the outward appeal of the room. That is why, Monsters Concrete Sacramento, make a great choice for concrete overlay Sacramento CA. We assure you timely work completion, that too in the best quality manner at affordable rates. Get in touch with us anytime for a free quote or to get any information related to concrete overlay Sacramento. We will be a call away to introduce you to our superior quality services. We will always be your reliable partner in improving the beauty of your home or office. Call us anytime to know how we can help you in concrete overlay Sacramento CA.